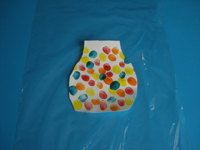 Even the smallest hands will be able to create this simple craft. 1. Gather your material. 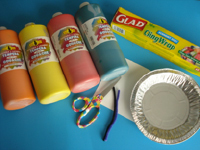 You will need green, yellow, red, and orange poster paint, an aluminum pie plate, white cardboard, pipe cleaners, scissors, and plastic wrap. 2. Pour a small amount of each paint color in the aluminum pie plate. 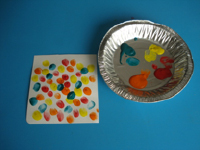 Encourage children to press their finger in one color at a time before pressing it on the white cardboard to make impressions representing colourful jelly beans. Let dry. 3. Cut the cardboard so it has a rounded shape on the bottom and a narrow shape at the top. Cut a large piece of plastic wrap and set your jelly bean-covered cardboard on top. 4. 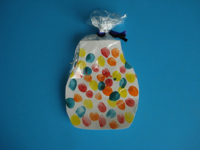 Fold the plastic wrap upwards to represent a bag of jelly beans, just like the ones distributed on Halloween night. 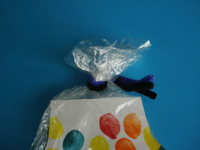 Wrap the pipe cleaner around the top of the plastic wrap as shown. 5. Prepare several jelly bean bags and hang them from the ceiling in your daycare to decorate.